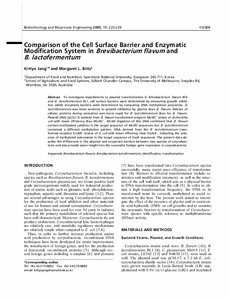 To investigate impediments to plasmid transformation in Brevibacterium flavum BF4 and S. lactofermentum BL1, cell surface barriers were determined by measuring growth inhibition whilst enzymatic barriers were determined by comparing DNA methylation properties. B. lactofermentum was more sensitive to growth inhibition by glycine than B. flavum. Release of cellular proteins during sonication was more rapid for S. lactofermentum than for B.. flavum. Plasmid DNA (pCSL17) isolated from B. flavum transformed recipient McrBC(+) strains of Escherichia coli with lower efficiency than McrBC(-). McrBC digestion of this DNA confirmed that B. flavum contain methylated cytidines in the target sequence of McrBC sequences but B. lactofermentum contained a different methylation pattern. DNA derived from the B. lactofermentum transformed recipient EcoKR(+) strains of E. coli with lower efficiency than EcoKR(-), indicating the presence of methylated adenosines in the target sequence of EcoK sequences. The present data describe the differences in the physical and enzymatic barriers between two species of corynebacteria and also provide some insight into the successful foreign gene expression in corynebacteria.